On one of the Fox news commentary shows mentioned the book, Licensed to Lie. They didn’t give many details, but my interest was piqued. I decided to check out the book from my local library. All the books were already checked out and there was a waiting list. I added my name to the list. After more than a month, I received notice the book was available for check-out. Licensed to Lie was written by Sidney Powell a female attorney. The subtitle of her book is “Exposing Corruption in the Department of Justice”. The theme of her book is Justice Department prosecutors aren’t out for justice, they are out for blood. Win at any cost, even if it means violating ethics rules. Powell’s clients were persecuted (sic) even though they haven’t broken any laws. One of the main points in her book is prosecutors are required to share evidence with the defense but routinely refuse to do so. When she objected on behalf of her clients, her trial judge consistently ruled in favor of the prosecution. She lost her case and appeals because she couldn’t get a fair shake from the “corrupt” Justice Department, the “biased” trial judge, or from the appellate courts. The book also devotes a few chapters to the prosecution of Alaska senator Ted Stevens. He was also persecuted by a corrupt Justice Department. Only he was eventually vindicated. Different judge, different appeals court, different outcome. Powell’s book goes into depth on the trials, prosecutions, and appeals surrounding the Enron scandal. Even though it wasn’t the primary intent of the book, the book is a good expose` about what happened after the Enron collapse. 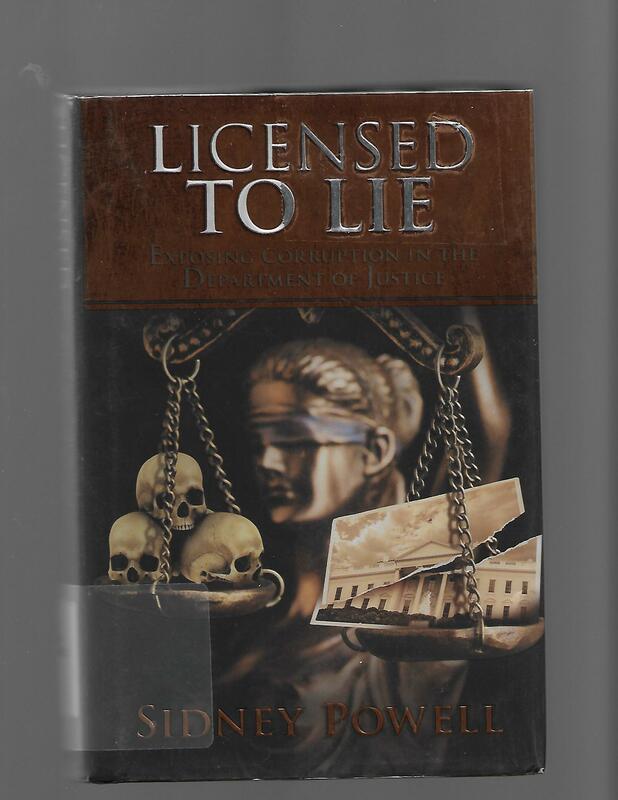 Licensed to Lie reminded me of a courtroom drama TV show except Powell book is about the legal process. The jury had already found her clients guilty. In the book, she is going before the judge multiple times to argue the legal issues surrounding her case. More often than not, she lost. 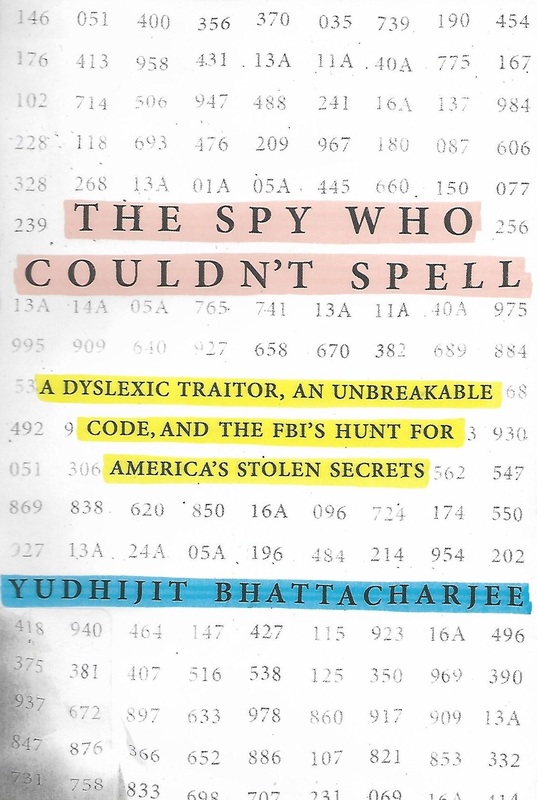 The Spy Who Couldn’t Spell by Yudhijit Bhattacharjee is an account of Brian Regan, a dyslexic Air Force Master Sergeant who downloaded thousands of pages of highly classified information then tried to sell the information to foreign governments. The book begins when the FBI intercepted a coded offer to sell secrets to the Libyan government. The FBI didn’t know who sent the message, but this person must be caught. If the information fell into the wrong hands, there would be immense damage to the U.S. military and intelligence apparatus. Cracking the codes would be key to determine who the traitor was. Due to his dyslexia, Brian Regan never learned to spell properly. He performed poorly throughout his school age years. Ostracized by other students, Regan was an outcast who barely made it through school. When it came time to graduate high school, he was given an opportunity to take an exam for entrance into the military. He passed the exam by cheating, and received a high enough score to be admitted into a school for Military Intelligence. In spite of his inability to spell and poor performance throughout is school years, Regan did well in Military Intelligence. Regan’s dyslexia was actually an asset because people with dyslexia are able to see patterns that would be difficult for people without dyslexia to see. Regan excelled and advanced rapidly through the enlisted ranks, achieving the rank of Master Sergeant. That’s when his advancement began to stall. As a Master Sergeant with a family, Regan’s debt started to get out of control. The resolution of his debt problems and his path to financial security and was to offer the nation’s secrets for sale. Regan printed off thousands of documents, smuggled them out of the office, and hid them in the woods all without detection. The subtitle of the book is A Dyslexic Traitor, an Unbreakable Code and the FBI’s Hunt for America’s Stolen Secrets. As an intelligence analyst, Regan received basic instruction on secret messages and codes. Code breaking was not Regan’s primary specialty but he did use his training and self instruction to develop his own secret codes. Coded messages are a major part of the story as the book provides history lessons and instruction about codes and cyphers and the FBI’s efforts to crack Regan’s secret messages. The agents were able to track the messages to Regan and catch him in the act of espionage, but that wasn’t the end of the story. There would be a trial, and the agents still needed to find the thousands of documents Regan had hidden – before they fell into the wrong hands. It seems the United States government doesn’t know how to keep its secrets. Time and time again we hear of people who download thousands of pages then leaked the secrets to WikiLeaks. Although The Spy Who Couldn’t Spell is the story of Brian Regan, it does briefly mention other notorious spies who stole sensitive information. Why do all of these people have access to information they don’t need for their jobs? Why do these things happen over and over again? Why was Regan able to print off and smuggle thousands of documents out of a secure facility – All without detection? How can a person unable to manage their debt maintain their security clearance? The book doesn’t answer these questions. These are questions the government should answer. Where can I get free pictures and images? CanDo Technologies © 2019. All Rights Reserved.